FAQ | Bavarian Cottages Ltd. Here are some of our most frequently asked questions about our cottage, shed, gazebo and sauna kits. Please read through them thoroughly as they will explain a great number of questions you may have and some you may not have even thought of yet. If there is anything you don't find answered, and there will be, please feel free to drop us a line and we might even add your question(s) to the list. Please also look at the page entitled about us for some more information about our company. In this section we cover the following list of questions. I have added a link to their exact location in the page for your convenience. They are ALL on this same page so once you have read the answer, just scroll to the top of this page again to go to the next one OR just read them all ! Why buy a prefabricated structure in the first place ? One of the BEST QUESTIONS to ask ! Type of wood we use for the construction of our cabins including the floor? I have two left hands so I am not that handy. Can I do this? How long to until you get your order? What color of stain is available for the cabin/shed. Can I paint it? What type of windows do you use and who makes them? Are they thermal windows? Can I have a skylight? How do you ship the kits and where can you ship to? Do you provide products like toilets, electrical items etc? Can you insulate these buildings? Can I have plumbing and electrical? Do these buildings meet code? How can I finish the inside of the building and how are they finished? Do they come with all the hardware? Can you put a wood stove in these building? How much room is there in the lofts? Q: Why buy a prefabricated structure in the first place ? A: Building a pre-fabricated structure is in every way better than on site construction, it's faster, less expensive, and GREENER because it reduces waste in all aspects of the build, from transportation, to material usage, to labor wastes. These all add up to money out of your pocket and a negative impact on the environment. Pre fabrication allows for extreme control over the quality of the materials and their protection from the elements which can significantly impact your buildings' quality. Lets face it, when it's hot or extremely cold or raining, quality is bound to suffer. People just want to get it done and over with. If the building is being built with damp/wet wood, shrinkage will dramatically increase and this leads to cracks in the drywall and creaks in the floor as things start to dry and shrink. Pre fabricated kits don't suffer from the same problems that plague the average construction project. Often too, the construction of homes built on site is done by less skiller laborers so the quality is compromised. With pre fab, the critical placement of boards and the precision of the cuts is clearly a cut above the rest. There are so many reasons that the quality control side alone makes pre fabrication the clear choice, but there are even more reasons, keep reading. Our factory waste is recycled and cut-offs and scraps are re-purposed. Transportation of your kit leaves a much smaller carbon footprint - pollution is greatly reduced by delivering your package in a more compact and inclusive form usually only requiring one load. No wasted time spent going back and forth to your local store retrieving missing pieces as our kits reduce the chances of job stoppage due to material shortages. Building with our pre cut components means less environmental footprint and less damage to natural areas surrounding your site; and as most of the cutting and nailing ( if applicable ) is done, you are creating a far quicker, quieter work environment. Less disturbance to your neighbors as well keeping the project moving quickly and unobtrusively. Q: What kind of wood do you use ? A: We use what is known in the industry as SPF, which means Spruce, Pine and Fir. In other words we use them all. That said, we use mostly spruce and pine but on occasion there is Alpine fir within the mix. For the floor sheathing, we generally use 19/32" OSB or 5/8" Plywood, which is the same thing you would find in almost any house construction going on today. Q: RARELY we get asked . We like cedar, can you make something out of cedar for us? A: We can build something out of cedar for you but be prepared to add a very hefty premium to the price. Cedar qualities range greatly and therefore it is harder to find a good cedar product. That and the fact that much of the cedar found today is still "green", which means it had not been dried or seasoned, means we cannot use it. Lastly cedar is not a very strong wood and some people even have allergies to it, so we opt to Stain our products with a very high quality stain that can be colored to achieve a look that is very similar to cedar but at much less cost. Q: What kind of foundation do I need? A: Well that really depends on where you are building, and what you are putting the foundation under ( shed/cabin ). For the most part, our sheds and some cabins are put on simple concrete blocks. That is the cheapest way to do it. On larger buildings or areas that require it, they can be installed on a concrete pier foundation or a full perimeter wall foundation etc. A: This obviously really depends on the size and complexity of the building. Sheds can often be built in as little as 3 hours. Cabins generally take at least 6 hours for the small ones, 2 days for the average bigger one and up to 4 or 5 days for the large ones. It really depends on your experience as well. That said, they are generally speaking all very easy to build. Q: I have two left hands so to speak, can I really do this? A: Well we have been doing this for years and regardless of experience, so far every client in the past 17 years has been able to do it and many report it was really fun to do. They are pre-cut so it does take a the guesswork out of it. Q: How long until you get your order? A: That entirely depends on when you order. As with anything, most people order right when they want it. Most people want cabins for May to June so they order in March. That said, we can only help so many people at one time and to be fair we do them in the order we receive them. Now please bare in mind, this is not a Happy Meal, no offence to McDonalds, but these do take time and we strive to add some personality to your order. This means, that you aren't just a number to us. We want to spend the time with each person to make sure this is going to suit your needs. If you want an instant building, we get close but we do need some lead way. 6-8 weeks is a common timeframe. If you need something for a specific time frame, please order early. All you need to do is place the deposit to get yourself in line. If you desperately need something sooner, call us. We're always willing to do what we can to accommodate you and in some circumstanced we can have something ready in just 2 weeks. Q: I have no idea where to start. I know one or all of the following but what now & how do I proceed once I know what I want? If you know any of these we can start to help you : Your budget , Your need, Your idea on paper, You minimum and maximum sizes. A: Well as long as you have some idea of what you want or a budget, we can work out a plan to fit you. If you tell us you need room for 4 and a bathroom, we can design something custom for you. Once you have decided on a plan, we make a formal quotation for you to go over and give an approval to. Once you are sure you have what you want for the agreed price, it's time to make a deposit. We require 65% down on all orders with the balance upon delivery or in some cases just prior to shipping. Once you place the deposit, there is no refund. Each building is specifically custom built. That said, once we start, we can in most cases ( 90% of the time ) still make changes to the plan. Q: What color of roofing can I choose. What type of roofs do you offer? A: All of our buildings come standard with Metal roofing at no extra charge. We feel metal roofing is the best overall roofing since it's light weight, easy to install and virtually maintenance free. However, we do allow you to choose the type of roofing you want. If you want asphalt shingle, cedar shake, clay tile, or even rolled asphalt roofing, we can accommodate you. 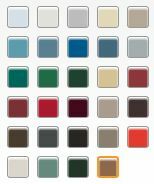 Below is a color swatch of the most popular metal roofing colors available, there are over 30 to choose from in total but these are the most common. We use tough 29 gauge metal roofing for all of our structures. READ MORE - THE BENEFITS OF USING STEEL ROOFING - Think Fire and Water Collection also. Q: What color of stains are there ? Can I choose which one I would like? Why do you insist on using Sikkens brand stains ? Do they make a paint I could use instead ? What about the insides? A: There are a large variety of stains and stain colors available. We exclusively use Sikkens brand stain on all of our buildings. Over years of testing, real life use, we find that although it's one of the most expensive stains on the market, it also outperforms the rest. This is the sole reason we include stain in almost every one of our buildings. We like this product so much, we encourage it's use on any wood project. We just feel it's the best period. Below are the colors available with our kits. Sikkens also makes a whole array of paints and such. If you want quality, this is one of the only stains to buy. Currently, we use the SRD 072 Butternut on most of our buildings. If you want to know more about the Sikkens brand click here SIKKENS. As mentioned above, they also make excellent paints and interior finishes. When you get your building, it is not protected inside. It is not necessary to do anything but a clear finish is recommended because it will make removing finger prints and such much easier. It also keeps the wood from changing color as much because it protects it from the sunlight and if you have a wood stove, the smoke dirt that usually builds up on the ceiling can be cleaned if necessary. Q: What type of windows do you use, who makes them and can I use my own ? A: We make many of the windows in house. They are ALL dual thermal pane sealed windows. In some cases, we also have and use a colored vinyl window inside our specialized frame. We can sell you a kit without windows but we don't recommend it due to the specialized style of window frame you must use. Again, if you need something special, we can either make it for you or accommodate you in some way if at all possible. Q: Can I have a skylight ? A: This is a tough question to answer. Although you can definitely install a skylight into most any roof, many skylights leak when installed incorrectly. One of the easiest installations is into Asphalt shingle. Since we use steel roofing almost exclusively, it is more difficult to do. We suggest that if you want a skylight, that you hire a professional roofer to install it. They have the know how and capability to make the flashing you need to make it function properly. If you have the experience to do it on your own, great, but most do not. That said, we can include them into almost any kit and will gladly do so. We also carry a very specicialized flashing not generally available that does help with the installation into a metal roof easy, talk to use about it ! Q: How do you ship and where can you ship to? A: We can ship almost anywhere. So far we have shipped to almost every corner of North America such as Alaska, New York, California, Hawaii, Nova Scotia and every province in Canada including the Territories. We generally use a broker to find the best prices for any given shipment. We also use companies like Reimer Roadway / Van Kam / Manitoulin / Excel and many more. The only real limit on shipping distance is cost. On average however, shipping is about 15% of the total cabin price but this can vary from 10% to 20% depending on where it's going to and a number of factors. Q: Do you provide products like toilets and electrical items etc ? Surrette, GNB ( batteries ), Heart, Trace, Jazz ( inverters ), BP Solar ( solar cells ), Bosch instant water heaters, Windseeker, Airco 403 ( wind generators ) to name a few. Q: Can you insulate these buildings ? A: Yes. All of our buildings can be insulated to whatever value you want. Most people insulate the floor and ceilings when they get their kit and then stop there. Some people choose to insulate the walls as well because they plan to stay in their place in winter as well. The choice is yours but we can help you with that. Many of our buildings are what we call "3 season" buildings. They are only used in Spring, Summer, and Fall. Therefore they don't need a lot of insulation. This saves you time and money. Again, if you need to use it all year round, we can help you design it to accommodate any amount of insulation you desire. Typically, code calls for R28 in ceilings and floors and R20 ( R22 in the US ) in the walls. This is easily achieved. If you want more information please feel free to email us with your questions. Q: Can I have plumbing and electrical in my building? A: Yes, you sure can. All of our buildings can have plumbing and electrical just like any other home or cabin. On our non insulated buildings, which generally lack the cavity in the wall to run insulation, we run it within the floor system, the roof system, interior partition walls etc. Plumbing is ran the same way. This poses no difficulty whatsoever. Q: Do these buildings meet code? A: All of our buildings can meet code but this depends entirely on the design you choose. Since this is a fairly complicated subject, it's best to call us so we can help you through the process. 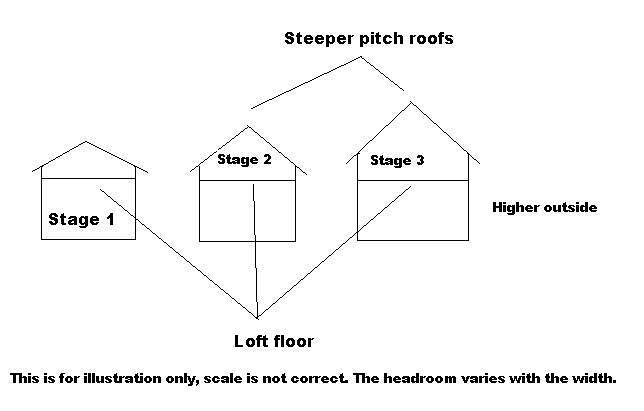 As a general overview, in order to meet code, you will need a permit ( this usually applies to buildings over 107.6 sq.ft / 10sq.meters ) and you will need to ask the local permit office to see what things might need to be done in addition to the National building code or the building code that your area is in. As I mentioned this is a lengthy subject and something that cannot be adequately covered in a few paragraphs. Please call if you have some questions. Q: How can I finish the inside of the building and how are they finished in the kit? A: As many of you know, these are "log" kits so there is not a lot of finishing needed in comparison to an average kit. In fact there is very little. However, the floor needs to be finished as it only has sheathing down. Some people paint the sheathing ( for rustic cabins ) and some people put carpet, linoleum, tile or click lock wood flooring down. It's truly a personal choice. Those options like carpet or click lock faux wood flooring usually start at about $1.00/ sq.ft at current prices ( Feb. 2014 ) The ceiling is the only larger area that is not finished. You can use drywall or sheet rock as some of you call it to do that or you can use solid wood as we often do. 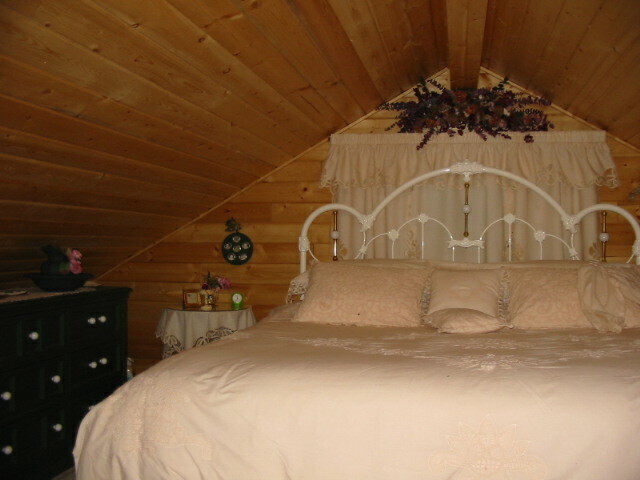 Again this is a personal choice, but anything you find in an average home can be used in our cabins just the same. Q: Do they come with all the hardware? A: Yes all of our buildings come with all the hardware needed to build them. The only hardware you would need to buy ( if any ) would be special hardware to tie the building down in high wind areas or hardware the building code or inspector asked you to have. Those would be your responsibility because we cannot include what may be needed in the hundreds of different situations. That said, those additional items don't usually add up to more than $100-$200 tops. This can vary but it's the most we have seen to date. Usually $50 will take care of it. Q: Can I put a wood stove in these buildings? A: Yes you absolutely can from a technical standpoint. The building can have anything normal installed into it. Legally, we cannot answer that. You would need to check with your local fire department etc.Many places now require the Ultra low emission wood stoves and some areas no longer allow wood stoves. We cannot comment on that because we don't know your area, but yes a wood stove can be installed. Q: How much room is there in the lofts? A: This really depends on the size of the building and to a great degree what you want. We can build them in different configurations but mostly, the bigger lofts have about 4-6ft of headroom. The largest buildings can exceed 11ft of headroom ! . Below is a guideline of our lofts on our small, average to mid size cabins. As you can see, we sell our buildings with three different loft packages. Stage I, II, and Stage III. Measurements are approximate but it gives you a good idea of the sizes. Stage I - is most suited for additional storage and a very small sleeping area. 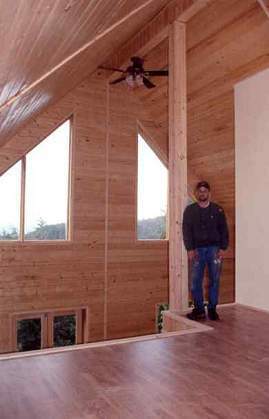 It is also our least expensive loft option. All we do is add a floor into the current building design. The outer walls are 8ft tall. Loft floor is inserted ( unless you say otherwise ) at 80" from the floor. Stage II - is most suited for storage and is much better for headroom for sleeping. We keep the outer walls at 8ft. Insert the loft floor at 80" from the floor BUT we steepen the pitch of the roof to give you more headroom ! Much better already. Stage III - This is our deluxe loft. It is a great place to sleep, has more than ample headroom and smaller people can often stand without hitting their head. Headroom is usually about 4'6" - 6'0" depending on the size of building. The outer wall height is increased to over 9ft, we insert the floor at 80" and we increase the roof pitch for even more headroom. Unfortunately, we do not have a picture of a Stage I loft. So far all lofts have been Stage III except one which was a Stage II. Below are some pictures showing each. They are marked so you can tell which one is which. Stage III loft showing a pull out sofa in place.